Ha. Numgeon. I see what you did there. 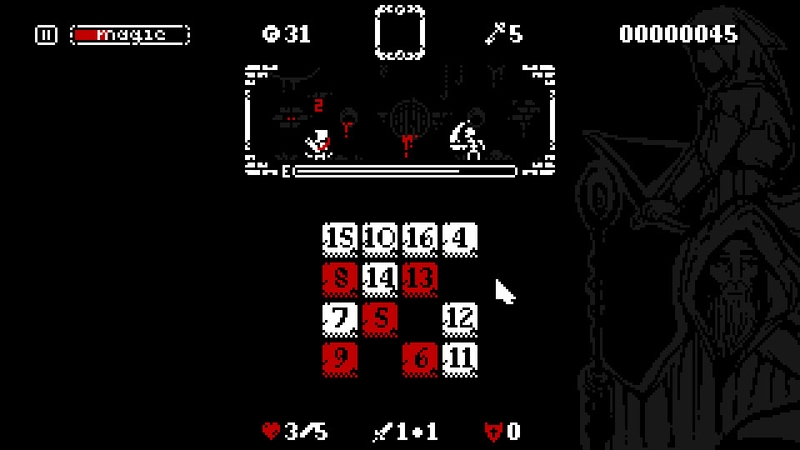 Clever, much like the game itself, which has you clicking numbers in an attempt to thwart off enemies. Simple stuff, right? Sure, except… it isn’t. You can’t just go spamming that left mouse button all over the place after all, hoping you’ll deal some sort of damage. Numbers have to be clicked in the right order or you’ll be on the other end of the sword. Or staff. Or dagger. Or spell. That’s not to say you have to solve complex math puzzles to land hits in this game so much as, well, know which number comes next. Then you click it, followed by the next, and the next, and so on, and so forth. Right up to the point where your current enemy drops dead and another takes its place. Unless something else happens, of course, as combat is only a small portion of the experience, shops, shrines, chests and other potential ‘events’ add to the mix. A mix that’s bound to get ya hooked before long, I’d wager. Oh, and be sure to hit the red numbers too as you click the night away, building up that huge combo, as these enable the use of magic. A feat which will come in handy as you traverse “the lands of Numgeon from the Sewers, through the Monastery and beyond”, even if its use does vary, depending on your choice of character. The further you go, the stronger you (and your opponents) will become and the more heroes, color palettes and game modes you’ll unlock! So what are you waiting for? Numgeon is available on Steam and itch.io, carrying a $2.99 price tag.